We’d love your help. Let us know what’s wrong with this preview of Crimson Earth by Anna Soliveres. In the sequel to the acclaimed Violet Storm, Aeva must decide how far she’ll go to protect her identity an Aeva Storm finally has the answers she’s been looking for since the night she was struck by lightning. She knows who she is—and more importantly, what she is. But her secret isn’t hers alone to keep, and some of those who know the truth will do anything to control her. To ask other readers questions about Crimson Earth, please sign up. So what is Crimson Earth? Well, firstly, it's not easy to write a great book that mixes cinematic action with compelling character development and flips the pages with excitement like there's a box fan next to the book, and it's even harder to write a sequel that's just as engrossing. My second Anna Soliveres book, I found myself thrilled by her dynamic sense of bone-crunching eye-popping action, and her ingenious plotting. Crimson Earth deals with the same themes of morality as Violet Storm but v So what is Crimson Earth? My second Anna Soliveres book, I found myself thrilled by her dynamic sense of bone-crunching eye-popping action, and her ingenious plotting. Crimson Earth deals with the same themes of morality as Violet Storm but ventures deeper into them through the characters we've come to know and count on; from the dangerous practices of transhumanism and genetic manipulation to the awful psychological effects of a dehumanizing post-apocalyptic wasteland, including things as bad as (view spoiler)[cannibalism!!! :0 (hide spoiler)] and through it all, Anna Soliveres exemplifies love and family and friendship and the desire to do good to others, no matter what the consequences. 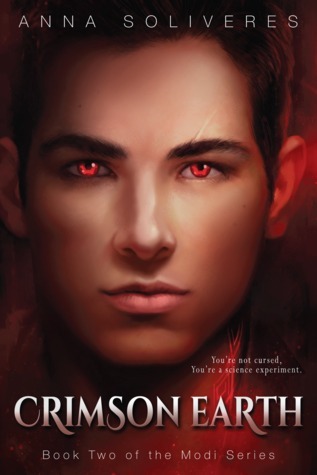 Ruven and his red eyes shine in this book, as he is quite a perfect YA male lead, and fans of YA sci-fi action/adventure must give these two books a shot and get ready to have their socks blown off. Let's hope there's more in the series!!! The biggest thanks goes to Anna for my signed copies! The whole world needs to read your books, Anna! This review has been hidden because it contains spoilers. To view it, click here. Thank you to author Anna Soliveres for providing me with an e-copy of this book in exchange for an honest review! Crimson Earth is the second novel in Anna Soliveres Modi series and is a deliciously fast paced and exciting sequel that wonderfully supports its predecessor and continues to shape an intriguing, exhilarating and well developed series. Having finally discovered the truth about what happened to her and why she was modifi Thank you to author Anna Soliveres for providing me with an e-copy of this book in exchange for an honest review! I have to say, I very much enjoy this series. Anna Soliveres shapes her world really well and details a very fast paced and exciting storyline that appears well developed and structured. The world within this series is harsh and brutal and delightfully intriguing. I never know what’s going to happen next and Soliveres well and truly keeps me on my toes with her steady revelations and developments. Aeva continues to be a great heroine to follow and I love her strength, tenacity and capability. Aeva has a lot of insecurities and has so many responsibilities resting on her shoulders, but she really is a great individual to follow. Flaws, insecurities and all, Aeva has been written as a character who is easy to like and who fights for those she loves. Set alongside a sci-fi/dystopian backdrop Crimson Earth continues to explore an interesting dystopian world where individuals can have their faces, bodies and abilities modified. No one is as they seem with Soliveres introducing and cementing a number of fantastic characters into the series; most notably Karth and Ruven. Personally the romantic in me hopes Aeva and Ruven work out the trials of their friendship/relationship, and I wouldn't be against Karth finding his own romance…..perhaps with a young woman who we finally find in this novel (*wink* *wink*). Crimson Earth is as fast paced, and possibly even more exciting than the first novel. Anna Soliveres does a fantastic job following up on her debut novel and expands even further on the world, characters and storyline within this series. Weaving together plenty of action, friendship and romance into the story, I highly recommended this series for those who love dystopian reads. Crimson Earth ends wonderfully—finishing one chapter and beginning the next thrilling one, and leaves me eager to get my hands upon the third novel Indigo Sky as soon as it’s released! Okay, I wrote it, so yes…I’m biased. I wanted a moment to fan-girl though, because the characters in this book are easy to fall in love with! First there’s Aeva. Despite being thrust into a hellish nightmare, she doesn’t completely break down and freak out when the insane and the unjustified happens. She holds herself together and reviews her options. Her biggest flaw is that she has a hard time letting go of her need to control everything and allowing others to aid her in her journey. Then there Okay, I wrote it, so yes…I’m biased. I wanted a moment to fan-girl though, because the characters in this book are easy to fall in love with! Then there’s Ruven. Oh Ruven. Despite the book not being written in his perspective, he definitely flourishes in this story. He falls and rises like the most beautiful sunrise. The dynamic between Aeva and Ruven is frenetic, unbalanced, and oh so very darkly sweet. I really enjoyed Violet Storm, which was the first in the series. It's a shame that it's taken me well over a year to get to book 2. And as with most sequels, I approached it with a certain amount of trepidation. Would it be as good as the first volume? The answer is "almost". I thought that the book was quite slow to start and get back into the action, but once it did, it was a case of hanging on for the ride. Action packed, and with more of the plot twists and tension which the author so succes I really enjoyed Violet Storm, which was the first in the series. It's a shame that it's taken me well over a year to get to book 2. And as with most sequels, I approached it with a certain amount of trepidation. Would it be as good as the first volume? The answer is "almost". I thought that the book was quite slow to start and get back into the action, but once it did, it was a case of hanging on for the ride. Action packed, and with more of the plot twists and tension which the author so successfully wove into book 1. The character development was, as before, well thought out and cohesive, with each of the main characters having their own very distinct voices, and manner of interacting with each other, thus creating and engaging and believable narrative, despite the subject matter. Great sequel. A truly worthy one. The chemistry and conflicts between the characters are intense. There were very late evenings when I knew I should have gone to sleep but I felt compelled to read “one more” chapter, especially after one particular plot twist that I refuse to spoil (let’s just say it was GOOD). Anna Soliveres’ attention to details, especially around combat, is impressive. I've been training under the discipline of Krav Maga and the action scenes described are spot on with what I' Great sequel. A truly worthy one. The chemistry and conflicts between the characters are intense. There were very late evenings when I knew I should have gone to sleep but I felt compelled to read “one more” chapter, especially after one particular plot twist that I refuse to spoil (let’s just say it was GOOD). Anna Soliveres’ attention to details, especially around combat, is impressive. I've been training under the discipline of Krav Maga and the action scenes described are spot on with what I'm practicing. Believable experiences in a science-fiction world are not easy to pull off! It's incredibly easy to get lost in Aeva Storm's world. It's simultaneously frightening and beautiful. In Book 1, Violent Storm, I was skeptical and a bit frightened by the modified humans; however, with Crimson Earth, I realize that they can be beautiful and soulful. Though the antagonist, Behr, is not at the forefront of the action, the characters are still affected by his presence, and act and react accordingly. Soliveres does a great job of creating tension without him being actively involved It's incredibly easy to get lost in Aeva Storm's world. It's simultaneously frightening and beautiful. Though the antagonist, Behr, is not at the forefront of the action, the characters are still affected by his presence, and act and react accordingly. Soliveres does a great job of creating tension without him being actively involved in the plot. You need to read Crimson Earth (I would start with Violet Storm though)! I cannot get enough of these characters and the amazing world they live in. I find myself day dreaming about what could possibly happen next... I won't spoil it for you... I seriously could not put this book down and now I'm going to start over from the first one, Violet Storm, so I don't have to give up Violet just yet. I cannot wait for the 3rd book! !